Image Below Or Add To Cart Our New 3” Barrel 38 Special Police Detective Model 5 Shot Revolver features newly developed finger grooved polymer grips for added fit and comfort. The 3” Detective fires single or double action and features a Swing out Cylinder for easy loading and ejecting. The Police Snub nose holds 5 of our loud 380/9MM blanks or our quieter 380/9MM half loads. 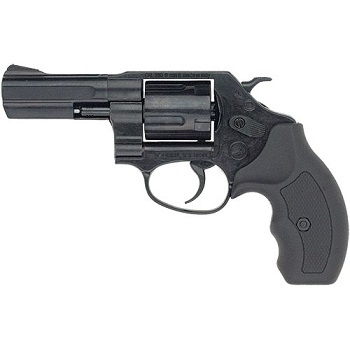 When have you seen a 3” Barrel Revolver? I would guess never. You see 2”, 4”, 6” and even a few 8” but NOT 3” barrel revolvers. They are so rare that this is the first 3” barrel blank gun I have ever seen. That is why after verifying its quality I had to add it to our line of Blank Guns. Total Length, 7.75”. Weight 2.2 lbs. For the quietest blank gun in a small theatre setting you may want to purchase a 6MM/22 Blank Gun.